Chief manufactures professional-grade AV mounts. I’ve built multiple sites for Chief & its parent company Milestone (acquired by Legrand in 2017). These designs are all based on user feedback, testing, and statistical analysis with a focus on improving the user experience. In preparation for a design refresh of the Chief website, I conducted a user survey with over 200 responses and gathered critical metrics from Google Analytics. I met with customers to conduct in-person user testing and worked with outside firms to build journey maps & run design thinking exercises. I compiled the data into a report with my recommendations and met with leadership to finalize a plan for the next version of the site. I developed a set of four personas to represent Chief’s core customers. These personas started with data gathered from 240 users that were surveyed online and then supplemented with in-person interviews. 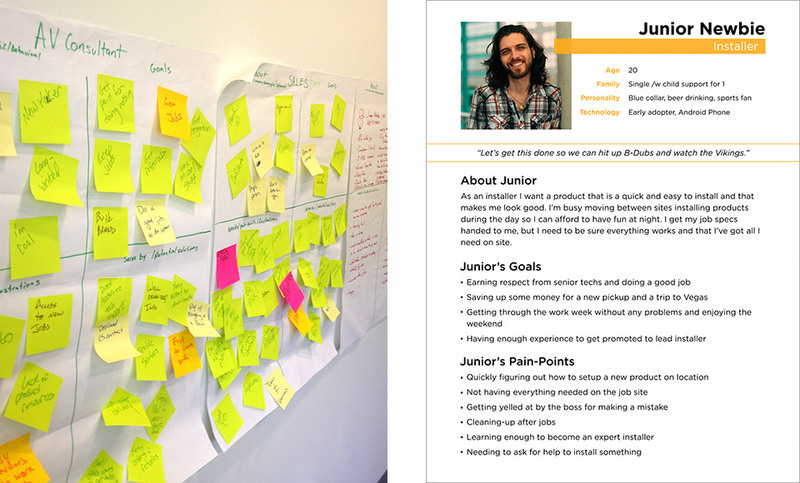 Finally, I led a brainstorm with employees across different departments that have customer contact to refine the personas. Before working on the first Chief redesign, I traveled to a tradeshow to help conduct live user testing with 30 dealers. Our users liked Chief’s current site, but found it too complicated and primarily used the search functionality. The updated design reduced the visual clutter and simplified the search. rAVe, one of the AV industry’s largest news sources, awarded the redesigned site ‘AV’s Best Website’ in their 2012 Readers’ Choice Awards. The final version of the design continued to improve usability & design with data gathered through a user survey, analytics data, and user testing. One of the most requested items from our users was for the ability to receive custom pricing from the website. I worked with technology teams from across the company to build a login system that could provide access to customer & product data from SAP, Salesforce, and other internal tools. Our additional goal was to integrate our certification program into our main website and consolidate several login systems that already existed.